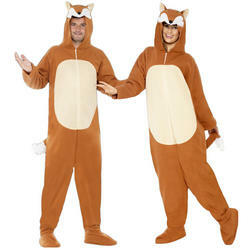 You too will be known to cunning and tricky when you put on this adults Fox costume. Roald Dahl's children's novel Fantastic Mr. Fox and the film adaptation are reasons to wear this outfit on World Book Day or at Film fancy dress parties. This easy-to-wear brown, printed zip up jumpsuit includes a hood that displays a fox's eyes as well as attached nose, white whiskers, and ears. Like the popular YouTube video by Ylvis, "What Does the Fox Say?" will be on everyone's mind when you appear in this comfortable onesie at storybook or movie themed parties.